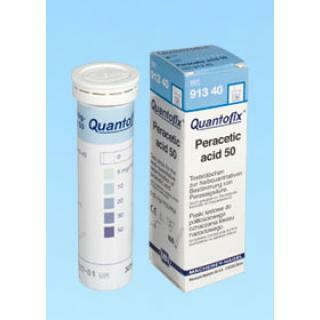 Quantofix Peracetic Acid - Water Analysis Test Strips This Quantofix test strip is for the fast and reliable determination of peracetic acid in solutions. 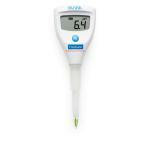 The easy dip-and-read procedure provides safe results within 30 seconds. Peracetic acid is one of the most powerful oxidizers known and often employed as a disinfectant. It is, for example, frequently used to disinfect bottles and packages in the beverage industry. After disinfection, packages are rinsed to wash out any remaining disinfectant. Along the same lines, peracetic acid is used in dialysis centers to clean dialysis machines. 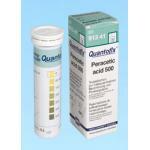 Quantofix Peracetic acid test strips can check quickly and easily, if the disinfectant has been removed completely. 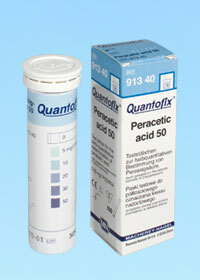 Quantofix Peracetic acid test strips are specific to peracetic acid. When adhering to the testing procedures the results are not influenced by hydrogen peroxide. Quantofix Peracetic acid are the ideal choice to detect peracetic acid in solutions quickly and easily.